Welcome to the second week of Four Fabulous Friday Freebies. If you haven't entered the amazing giveaway featured last Friday by Be Design Solutions then the good news is that you are not too late. Entries close tonight (20:00 AEST), so pop on over and enter right here. As you would have seen yesterday, I am a bit of a Nigella Lawson fan and so when I was given the chance by my fabulous sponsor, Stockland, to offer up two of my lovely readers the chance to win a copy of the bestselling 'How To Be A Domestic Goddess' cookbook I naturally jumped!! As you have probably gathered, baking and comfort cooking are two of my most favourite things, so this book seemed to have my name written all over it! This cookbook has all of your baking favourites from cakes, pies, pastries, preserves and puddings to bread and biscuits. I love the sections on Christmas and cooking for kids and have already marked many recipes to try (Snickers and Peanut Butter Muffins anyone?!). I know so many of you are just going to adore this prize! Stockland is Australia’s largest diversified property group, with a range of home, land and retail developments across Australia. From houses for sale in Maitland to house and land packages in Craigieburn, there is sure to be a place to build your perfect home. And, as a leading sustainable organisation, Stockland’s developments are designed to enhance the environment – not to spoil it. Stockland gives your family a place to truly call home – a place where your family can live and grow. Good luck everyone and thank you to Stockland!! Those muffins sound amazing! I'd love to try some of Nigella's recipes. Like you, I love baking and cooking for my family and friends. My most loved recipe book has to be 'fast fresh & fabulous' by Janelle Bloom! Some great homely recipes in there, including my favourite Portuguese custard tarts. My favourite online recipe resource is www.exclusivelyfood.com.au. Those girls know how to whip up a recipe or two, and they never fail! I promise. I just made their butter cake for my son's birthday. Amazing stuff. I think I've tried almost all their recipes now, and have never once had a failure. Thanks for the opportunity to win the gorgeous Nigella's cookbook, Allison & Stockland! Good luck everyone! ps I'm already a fan of your facebook ;) & my full name is Leah Mayes. My husband was the one who got me into Nigella, he appreciates that real "home cook" feel she has. And I can suppose her natural good looks doesn't hurt either. Love Nigella! I love to bake chocolate chip biscuits. I also like baking chocolate cake, oat and raisin biscuits and I've made you banana caramel cake and it was yummy! Oh I love Nigella, my favourite thing to bake at home is Muffins, they can be sweet or savoury and are so so easy and versatile. My favourite thing to bake? There are too many things! I love having the knowledge that I can bake anything, I can cook whatever my heart desires. Crossoints? Done it (albeit took a few days) Bagels? Nailed them. But my favourite? Well I'd have to say the facourite is our weekend breakfast of Japanese style crepes. They're not hard, but my family love them, and that is why I cook. To make them smile, help them grow healthy, and to teach them that with the right knowledge, and determination, you can do anything. Ok liked you as me and Desire Empire. My full name is Carolyn Darragh and my favourite recipe is slow cooked lamb shanks. I made Nigella's Chocoalte Gingerbread for the first time for my hubby's birthday the other day...and what a hit!!! Can't wait to make it again!!! Baking is my new hobby! Cupcakes, cupcakes and more cupcakes! The ultimate vanilla cupcake is my favorite at the moment. I love to bake cakes and cookies! Ooops just posted commented for Nigella giveaway on the other giveaway, anyway. I would love to win this cookbook I think Nigella is such a beautiful woman. At the moment our favorite recipe is white chocolate and blueberry muffins, but our favorite always change. Thank you for offering such fabulous giveaways. Ahh, I love Nigella :) I have some of her DVDs and one of her books, but I'd love to get more of her books - I caught the bug! My favourite thing to bake is brownies, everybody loves them and I can mix it up using different kinds of chocolate and adding mix-ins. I'm a fan on FB as Kate Ryan. I love baking sausage rolls. They taste great and are lovely on a cold day. I love baking a McCains frozen meat pie. It's the best I can do since I can't cook! My ultimate favourite recipe is Nigella's Rhubarb Fool. It is my easy yet impressive dessert. Everybody thinks you have slaved over the whisk, however it is simple and delicious! I must admit I'm not really a whiz at baking (and hence the need for a Nigella cookbook to help along my cooking skills). My favourite recipe to bake at home is pavlova! Sometimes its chewy, sometimes its fluffy and sometimes it cracks and collapses in the middle.. but its still delicious! My favourite thing to bake is vanilla cupcakes. So simple and a blank slate for pretty decorations. I love to make ginger cake, my secret is using three types of ginger, fresh, powdered and crystallized. It always taste better after a few days. i love to bake homemade healthy(ish) muffins for my girls im also pretty good at a choc chip biscuit but thats about it! would love the nigella book to try a few new things out! I love to eat baked goods but not so good at baking them myself!! I do however enjoy baking simple cookies and cupcakes. 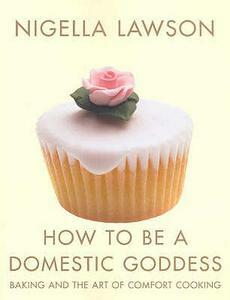 I've watched Nigella on tv and most of her recipies seem quite simple so I'd love to win one of her books. Thanks for the opportunity to win! My favourite recipe to bake is chocolate brownies ... anything chocolate really. I love to bake Banana Bread. It is just divine, nice and warm straight from the oven. Yumm!! I love to bake scones, so old fashione d I know ! Right now I am loving cooking mini muffins, particularly blueberry ones. So easy to chuck in the freezer and then pop into a ziplock bag for work. My favourite thing to bake at home are banana, honey and cinnamon muffins, because they're healthy and tasty and the perfect fix for when we have brown spotty bananas in the fruit bowl that nobody wants to eat! My favourite recipe to cook is chocolate brownies, Nigella's recipe actually. There is something about melting the chocolate and stirring it in that makes me feel so warm and cosy. Then there is eating the hot centre with a spoon when it comes out of the oven which bring back childhood memories. I like to cook with soul like Nigella! For many years I have enjoyed making slices, as not much can go wrong.Over the years my chidren and have had to say "it doesn't look like the picture"! I don't have a favourite recipe, but my special needs brother loves cooking a chocolate chip cookie, and I enjoy with he learns to cook with me just wish he like more things healthy. My fav thing to bake is banana cake with cream cheese frosting - it's always a winner! I would live to get my hands on this book to try out some new recipes. My favorite things to bake are chocolate brownies for something sweet and a good roast lamb for a family Sunday dinner.